La Crèmerie’s pâtés come in various styles, smooth and creamy ones are usually made from liver and often referred to as a Mousse, such as the Mousse de Canard. Other pâtés which are spreadable but have some chunks in them such as the Ardennes pate which is made with liver and tasty chunks of meat. And then there are the coarse country style terrines which have a lot of meat and are generally sliced rather than spread. A baguette is a great accompaniment for any pâté however a good country bread will go well with the more coarse country terrines. 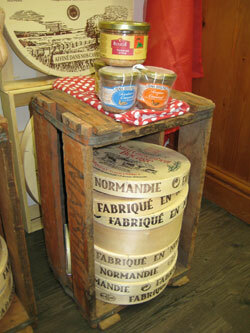 Very often the French choose red wine to pair with their choice of pâté. The smooth pâté stocked in La Crèmerie are usually made with liver, some herbs and spices and other ingredients such as garlic. They are wonderful to spread on a crisp baguette or a small piece of toast. Our usual stock includes the Mousse Forrestiere, a creamy pork liver pâté made with woodland mushrooms which are picked in the forests of France. The mushrooms give the Mousse Forrestiere pâté, a delicious woody flavour and is an absolute must to try. Another popular smooth pâté is the Duck mousse which has a very gamey flavour. The outside is coated with buttercup yellow duck fat, while the inside is smooth and easy to spread on toast. This makes great canapés to serve at a cocktail party or as a starter for a dinner. The coarse textured terrines usually have some liver to bind the mixture; however their main ingredient is chunky meat pieces. These terrines are usually sliced with a sharp knife and served with crisp baguettes and cornichons, tart French baby gherkins. La Crèmerie stocks terrrines made with pork such as the Greenpeppercorn terrine, which has a coarse pork meat mixed with crunchy bits of green peppercorn giving it a slightly peppery taste. Also displayed out front are terrines made from duck meat such as the Duck and Orange terrine, the game flavour of the duck meat is beautifully balanced by the bitter orange flavour. The duck and asparagus terrine is made with Magret de Canard, (duck breast meat) and the green asparagus gives a wonderful contrast to the flavour of the duck breast. These terrines can be served at picnics, as starters before a dinner or as a main course for a light lunch. Mi-cuit (trans – half cooked) is Foie gras that has been lightly cooked and has a very smooth light texture and is the nearest experience to the freshly cooked one. It has to be kept refrigerated until eaten. The Foie gras “Entier” is a preserved whole piece of cooked liver which can be kept in a cupboard at room temperature for several years. A bloc of Foie gras is preserved pieces of liver that have been blended together then cooked. This can be kept in a cupboard at room temperature for several years and is traditionally served with a glass of chilled Pineau de Charente or a sweet wine. 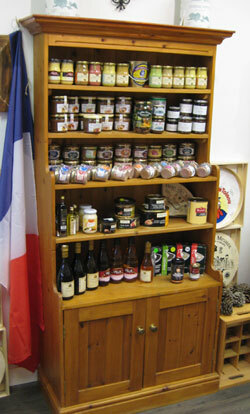 La Crèmerie stocks many different French meats and pâtés, each more delicious than the next. Take a trip down to La Crèmerie in Gardens Centre and talk to the owner, Suzanne, there is noone more knowledgable on French cuisine in Cape Town.